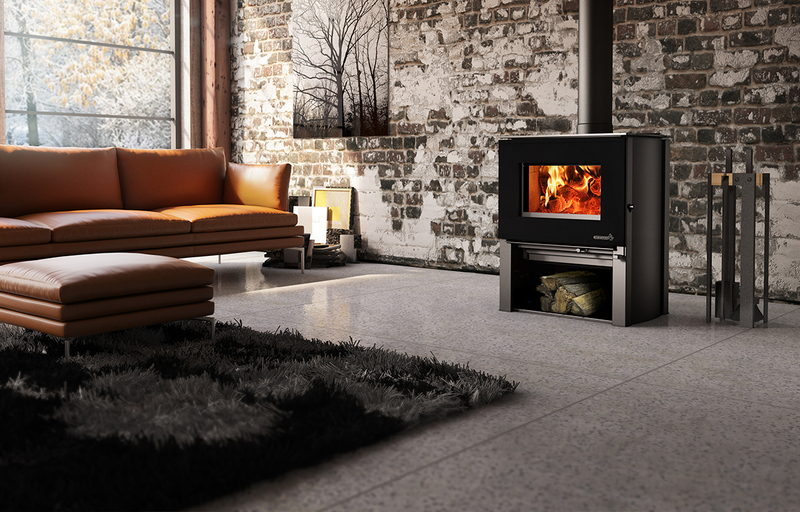 The Destination 1.6 is the ideal heating appliance for those looking for efficiency and a contemporary interior design. This small ecological wood stove provides a maximum heat output of 55,000 BTU/h with an emissions rate of only 4.0 g/h. It features an incredible view of the fire and comes with an easy-to-operate door latch system that complements its clean lines. In addition to providing a convenient and safe pedestal to store your logs, the Destination 1.6 can be customized according to your taste and décor, thanks to its modular side panels available in a variety of different finishes. You will also have the choice of adding a 130 CFM blower and a thermodisc for improved heat distribution. Moreover, it can be connected to a fresh air kit without the need for any special adaptor. 100% of the last 4 homeowners who have registered their warranty are satisfied with this product. GLASS HEARTH PAD 10 mm - 54" X 46 3/4"
Glass surface – dimensions (Width X Height) 15 7/8" X 9"
Overall dimension (Height) 32 7/8"
Overall dimension (Width) 26 1/8"
Overall dimension (Depth) 20 5/8"
Door opening – dimension (Height) 7 1/2"
Door opening - dimension (Width) 15 3/4"
Firebox – dimension (Height) 12 1/4"
Firebox – dimension (Width) 18 1/8"
Firebox – dimension (Depth) 13 1/2"
Clearance – back wall 15" 12" 15" 12"
Clearance – placed in a corner 8 1/2" 6" 8" 6"
Clearance – side wall 16" 16" 16" 16"